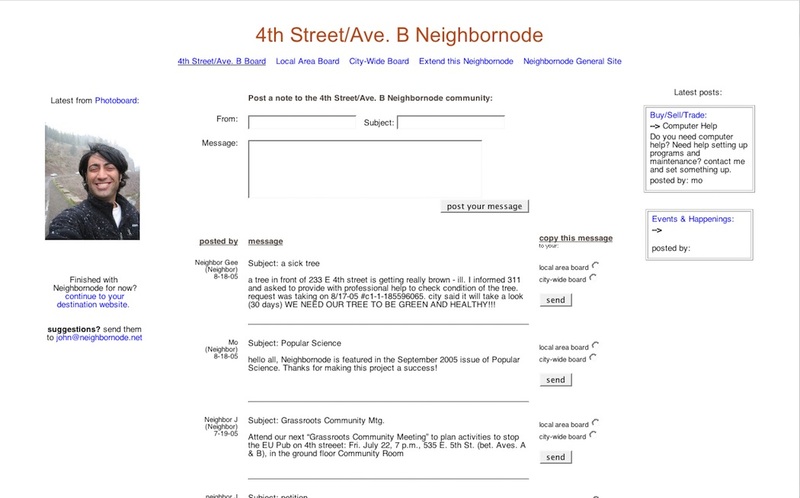 Neighbornode was an attempt to unite community members via a shared internet access. Neighbornode was built in 2005 by John Geraci, Hans-Christoph Steiner, and myself. We experimented with sharing creating a shared community resource and communicating with users digitally. Neighbornode wad featured on CBS 2 New York, The New York Times, and within Popular Science. Neighbornodes were group message boards on wireless nodes, placed in residential areas and open to the public. These nodes transmit signal for around 300 feet, so everyone within that range has access to the board and can read and post to it. This means that with a Neighbornode you could broadcast a message to roughly everyone whose apartment window is within 300 feet of yours (and has line of sight), and they can broadcast messages back to you. Boards are only accessible from computers that go through the local node. Additionally, Neighbornodes were linked together, making up a node network to enable the passing of news and information on a street-by-street basis throughout the wider community. With access to a local Neighbornode, one could post messages to a local group board, as well as forward messages to other nodes in the vicinity. These other nodes could in turn forward messages to other nodes, resulting in a network of neighborhood message boards. We wrote custom software on top of open source code that enabled us to create these portals on LinkSys WRT54G routers. We attempted to get strangers living within a community to start conversing with each other through a simple Bulletin Board that offered free internet access. We were written up in The New York Times, Popular Science, featured on CBS 2 New York, and helped distribute our customized software free to over fifty users throughout the country. We may have been early with this project in 2005, but we were on to something. Please Note: These files are not for distribution.